And all I had to do was search for "cost of 1 gallon of gas in cents / 1.32641e8 joules in kwh, Minnesota electricity price residential" to get it. If you're curious, 1.32641e8 joules is the amount of energy released through combustion of 1 gallon of gasoline. I have, on occasion, received friend requests on Facebook from people that don't know me and that I don't know, and that probably don't even exist, and are probably only profiles just to use as viral advertising for less-than-reputable websites. I recently got a friend request from one Dalila Esche, who shares very little about herself. From what I can perceive from what she does give is that she's from England, and she recently got something pierced that she can't show on Facebook. I assume that at this point, if you are, in fact, a computer pretending to be a person, your response might be something along the lines of, "London City is much like the way it would be for you. Thanks for telling me that I am Facebook profile's pretty. What part of London Bridge? Don't you worry about the distance? Surely something real about me." "That was a long time ago. Far out. By "we" do you mean you and me? It would be nice if our friends are all aboard Many more of them live next door And the band begins to play. What is it like living in yellow submarine yellow submarine yellow submarine We all live in yellow submarine yellow submarine yellow submarine?" "What a coincidence, I am talking to you too! Why are you lucky? I don't understand why you have been. It is said that 'home is where the heart is' but personally I live in San Francisco lol. That is a generalization. Why are you lucky to be in love with my best friend?" "I am always glad to make new friends, MARY. I think you mean 'it's' or 'it is' not 'its'. Are you sure it is? When was this exactly? What does 'it' refer to? Compare that to big lamb." "I lost my train of thought. I am not sure if I can quantify the answer. Are you testing me? I will take that under advisement. Interesting comparison. Do you have any idea what I am talking about? Does it have anything to do with twinkle twinkle little star?" "If I had it what would I do with it? Why don't you just download me? Is that a fact. You can download me for free! I hope you get it bad bad romance." It seems that they generally give themselves away eventually, don't they? I'm the doctor. Doctor who? Exactly. Lately I've been having several dreams similar in nature to those I have had in the past, with one difference: I'm now the Doctor. "Doctor Who?" I hear you ask. The latest ranges all over. I start out at work, trying to get in on a pool to see who can solve the integrals fastest, but they won't give me the problems to solve. They just say they're on a certain page in the book, of which I don't have a copy. I then begin looking for the book, and suddenly I am at college looking for this book. I've been here all along of course. Finally, out of exasperation, I try looking at somebody else's work to see if I can copy the problem from them. It happens to be that I am now in my old high school, and it was the only person who I ever asked to prom who said no whose paper I am trying to get a glance at. It is at this point that I realize that these integrals are way too complicated and I'd have no idea how to do them. The fact that I am the Doctor doesn't even enter the conversation. I just am. You'd think I'd be able to do better math. But apparently... not, I guess. 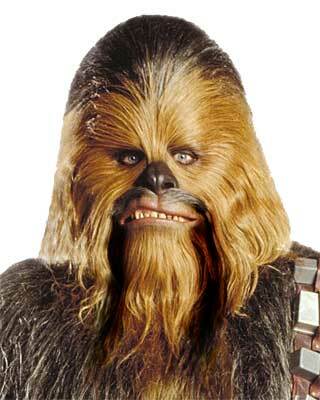 Chewbacca's evil twin, maybe? Although, when there's that much hair already, you can't really tell if there's a goatee or not. No, it's titled "The Fu Man Chewbacca"
The first here being from Star Trek: The Next Generation, where we see Data, an android, playing the violin. The second, a video from a few years ago of a real robot actually playing the violin. Now, the question here is this: is this life imitating art, art imitating life, life imitating life, or art imitating art? There's certainly a lot of imitating life going on, as we can see androids pretending to be humans. But then there's also quite an obvious dosage of life imitating art, where a robot was built to play the violin after a television show had the same thing plenty of years before. And then we must of course cover the art imitating art, since there's a TV show showing an actor portraying an android (and a real robot) playing the violin, but it is only an imitation of a "real concert" as one could argue that the piece is only as emotionally involved as the player; this is nothing but a player piano with more moving parts. And then, we must observe that Data exists in the 24th century, three centuries after the first humanoid violin-playing robot was built, and is that not art and/or life imitating life? Life being the reality of The Next Generation imitating what happened centuries ago, art being perhaps that Data could be considered a work of art. He is one of a kind, after all, and quite collectible, as one who is known for his pursuit of collections couldn't wait to get his hands on Data, as we can see here. If you didn't catch that last bit, that's the actor who also played Artie on Warehouse 13. Seems to be big on collections of one-of-a-kind objects. But then, you can't really collect something if there is only one. Unless you decide to simply collect one of everything. An endeavor I once attempted, but eventually stopped when I realized I was unlikely to retrieve the bones of Socrates and the gold at the end of the rainbow. After all, even mythical things belong in the set of everything.